Press Conference on 26.03.2009 in Erfurt - Katzhütte Isolation Camp is not closed yet! *Invitation to the Campaign of The VOICE Refugee Forum: Katzhütte is not closed yet! Katzhütte Isolation Camp is not closed yet! One year ago, we, the refugees from Katzhütte started our protest for the closure of the camp in Katzhütte. Then, refugees for the first time formulated their demands for the improvement of their situation in the camp. With time, the protest developed and with it our consciousness and our demands, and the struggle in Katzhütte became an example for other refugees in similar situations. One year later, the impact of this protest is felt in the whole of Thüringen. Today the exploitation-company of refugee housing K + S is withdrawing their service to control the refugees and the maintenance of the isolation camp in Katzhütte. The closure of the camp by the refugees is just one step ahead. The project by the head of the administration of the Landkreis to keep the lager is about to fall into pieces, only a last push is needed to for it fall. During the congress delegates will speak on the hostile asylum policies towards the refugees in Katzhütte and Thüringen and the role of the SPD leader Mrs. Marion Phillipp of the districts of Saalfeld – Rudolstadt. The refugee protests and their demands for normal housing, we are calling you all again to join our campaigns to close the isolation camps in Katzhütte, Gehlberg and Apolda (Stobraer Straße 86) in Thüringen. Refugees and activists who formally lived in Katzhütte and Gehlberg with those still living there will present their struggles and their solidarity with other protest refugee activists in other lagers and isolation camps. Reports on the perspectives of refugee struggles and the objectives of the refugees’ self-organized political communities in the lagers and isolation camps will be presented in the congress by refugee activists from Oldenburg/ Blankenburg, Sachsen-Anhalt, Nordrhein-Westfalen and Thüringen. There will be exchange of information on the experiences and ideas in the struggles with refugee protests in their lagers and isolation camps in Thüringen with The VOICE Refugee, the Refugee Council of Thüringen and delegates of the nationwide Caravan for the rights of refugees and migrants. 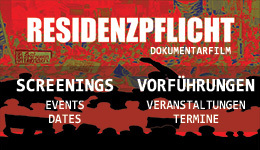 The conference will be accompanied by a cultural program with a documentary film on the refugee struggles in Blankenburg, a concert of the group LesRéfugies from Blankenburg with a mixture of Reggae, Afro-Beat and Rap and a photo presentation on the Katzhütte actions and protest. This event is organized by The VOICE Refugee Forum, Jena Germany in the Nationwide Caravan network. Supported by The Refugee Council in Thueringen, RedRoxx and Geberstrasse Weimar.